Kick off your visit on the 10th (Sun): see exotic creatures in open habitats at a safari tour, then Head underground at Syvasenvaara Fell, and then get engrossed in the history at Arktikum. To see other places to visit, traveler tips, maps, and other tourist information, go to the Rovaniemi trip itinerary app . Newark, USA to Rovaniemi is an approximately 17-hour flight. The time zone difference when traveling from Newark to Rovaniemi is 7 hours. When traveling from Newark in February, plan for colder days in Rovaniemi, with highs around 22°F, while nights are slightly colder with lows around 14°F. Wrap up your sightseeing on the 10th (Sun) early enough to drive to Akaslompolo. Start off your visit on the 11th (Mon): see exotic creatures in open habitats at a safari tour and then hit the slopes at Yllas Ski Resort. To see where to stay, ratings, other places to visit, and more tourist information, read Akaslompolo online journey planner . Traveling by car from Rovaniemi to Akaslompolo takes 2.5 hours. Alternatively, you can take a bus. In February in Akaslompolo, expect temperatures between 24°F during the day and 13°F at night. Wrap up your sightseeing on the 11th (Mon) early enough to drive to Levi. Start off your visit on the 12th (Tue): glide through natural beauty at Levi Ski Resort. Here are some ideas for day two: look for gifts at Elan Ski Shop & Rental, then see exotic creatures in open habitats at a safari tour, and then explore and take pictures at Ice Karting Levi. To see maps, other places to visit, ratings, and other tourist information, go to the Levi online travel planner . Traveling by car from Akaslompolo to Levi takes 1.5 hours. Alternatively, you can take a bus. Expect a daytime high around 24°F in February, and nighttime lows around 13°F. Finish up your sightseeing early on the 13th (Wed) so you can travel to Kuusamo. Kuusamo is a town and municipality in Finland. 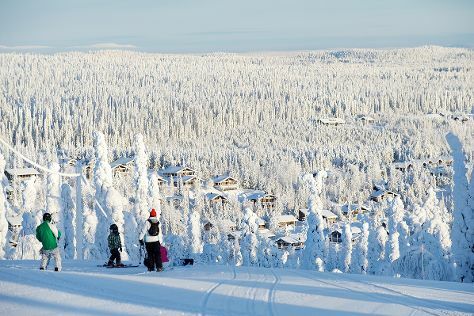 Start off your visit on the 14th (Thu): fly down the slopes at Ruka, then take in breathtaking views at Kiutakongas Rapids, and then look for gifts at Shopping Center Kumpare. To see photos, other places to visit, reviews, and tourist information, you can read our Kuusamo trip itinerary app . Do a combination of bus and flight from Levi to Kuusamo in 5 hours. Alternatively, you can drive; or take a bus. In February, daytime highs in Kuusamo are 24°F, while nighttime lows are 13°F. Cap off your sightseeing on the 14th (Thu) early enough to travel to Helsinki. On the 15th (Fri), explore the wealth of natural beauty at Nuuksio National Park. Keep things going the next day: take in the spiritual surroundings of Rock Church, identify plant and animal life at Laajalahti Nature Reserve, then brush up on your military savvy at Sea Fortress Suomenlinna, and finally admire the masterpieces at Kansallisgalleria. For reviews, other places to visit, more things to do, and more tourist information, refer to the Helsinki sightseeing planning app . You can fly from Kuusamo to Helsinki in 3 hours. Other options are to drive; or do a combination of bus and train. Expect somewhat warmer temperatures when traveling from Kuusamo in February; daily highs in Helsinki reach 33°F and lows reach 26°F. On the 17th (Sun), wrap the sightseeing up by early afternoon so you can travel back home.